American Express emailed a lot of HFP readers yesterday with an attractive transfer bonus. Between 21st November and 21st December, they will receive a 50% bonus on Membership Rewards transfers to Hilton Honors. The rate increases from 1:2 to 1:3. This is very good. I value a Hilton Honors point at 0.33p. Because you can use Hilton points to part-pay cash bookings at roughly this level, even if you can’t get a standard redemption room, there is a floor beyond which the value won’t fall. With the transfer bonus, you are getting around 1p per Amex Membership Rewards point. This is as good as it gets, and puts Hilton Honors transfers on a par with Radisson Rewards (usually 1:3 with a similar 0.33p per point value) and frequent flyer mile transfers (assuming 1p per mile of value). The bad news is that the offer appears to be targeted. I didn’t get it (I have transferred to Hilton Honors before) and neither did my wife (no previous Hilton transfers). I have done a speculative 200 point transfer and will report back, but if you didn’t get the email you should assume that you are not getting the bonus. If you DID get the email then it is well worth considering. It isn’t a knockout deal – as I said, it simply moves Hilton onto equal footing with Radisson and the airlines – but it is also as good as you’ll see for an Amex redemption. Is London City getting ‘proper’ Business Class seating on BA? British Airways has recently leased two Embraer 190 aircraft from Stobart Air to use at London City Airport. It seems that BA’s brand new E190 aircraft have been delayed and that Stobart Air will be picking up the slack for a few months. One rumour is that Stobart Air is using part of the old Virgin Australia E190 fleet which was retired earlier this year. 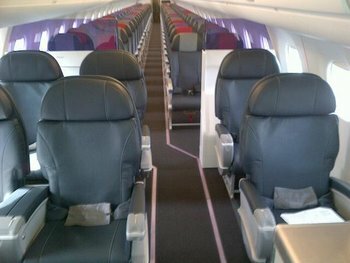 As you can see below, there are six business class seats – and they look pretty good by British Airways standards! As the first aircraft is meant to be operational now we should get confirmation very soon. Avios partner (you earn 4 Avios per £1) Charles Tyrwhitt is offering 20% off everything you buy from today until 26th November. This covers shirts, suits, ties …. the lot. The code you need online is FRIDAY. The website is here but the deal is also valid in-store. You can earn Avios online and in their shops – just tell the staff your British Airways Executive Club number at the till. OT: Marriott/SPG redemptions. Trying to do a multi night redemption at a Sheraton. No matter the combination of nights it tells me “Sorry, this hotel is not accepting redemptions”. Yet same dates work when booking single nights. So I have booked all 5 nights as singles, and intend to contact Marriott to get the bookings linked up and get the points back for my 5th night free! All very odd and hopefully not cynical… can anyone shed any light? I think we’ve agreed it is now targeted. I called Amex about the 3:1 conversion offer and they said that it was actually an offer that you had to save to your card to get it, with a limited number of slots. There is no information within the targeted email to imply that it was an offer you had to save to your card. Did anyone actually see this offer on their card? Hi all, slightly off topic but I’m new to points collecting, and wondering about the referral bonus for the Amex gold rewards card. I got my card in the summer and have just referred my wife for the card – she’s been approved and now has hers. Can she add me as her supplementary cardholder to help her reach the spending bonus, or would that invalidate it as I already hold an Amex? Thanks! Has anyone that was targeted with the Hilton offer had their bonus points appear yet?